Since getting my hair cut, I'm trying to take much more care of it so I turned to my trusty Lush for some products to keep it in tip-top condition. 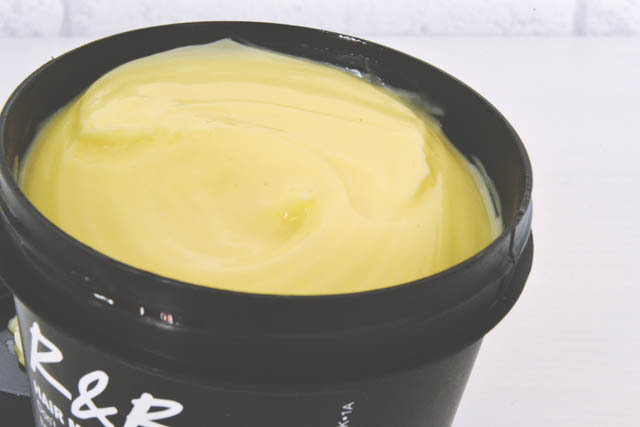 This little pot is filled with a hair balm designed to minimise the appearance of split ends and help prevent further damage. In a small silver tin, it's perfect for throwing into my bag to touch up on the go, although the lid is a bit fiddly. 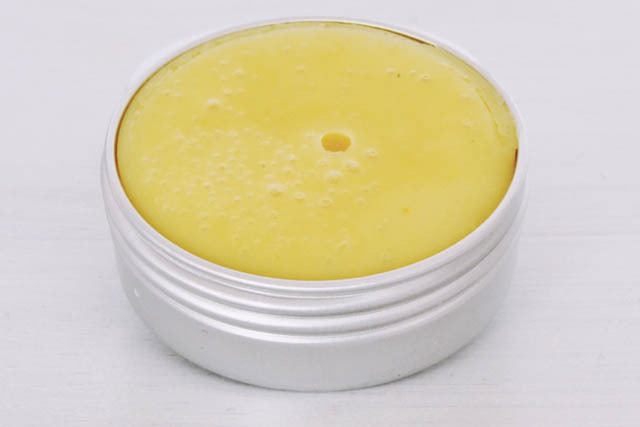 Inside, the waxy balm has a warm, almost spicy scent of neroli and shea butter. Vegans will be glad to read that it's made of candelilla wax, rather than beeswax. To apply, just rub your fingers over the wax and apply to the ends of your hair. It's easy to build up enough to make a difference without looking greasy and it really does make the ends of my hair look a lot more healthy and moisturised. Not only that but my hair smells amazing for hours after. It's fast becoming an essential for me. 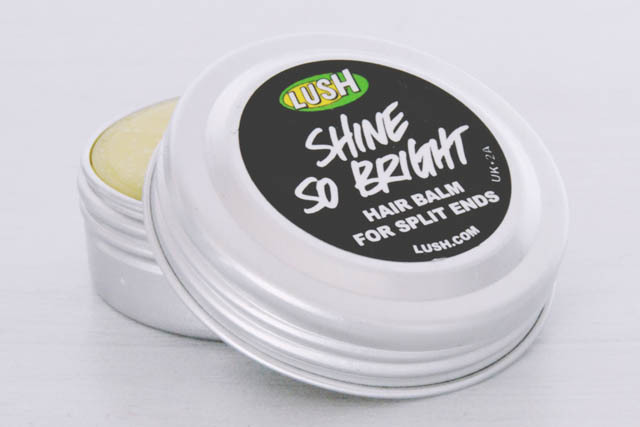 Since I have such dry hair, and I've heard a lot of wonderful things about Lush hair moisturisers, I spent a bit of time trying to settle on the right one for me. Eventually I picked R&B based on ample use of butters and oils including coconut oil, jojoba oil, cupucau butter and avocado butter. The moisturiser is packaged inside a black pot which is my favourite packaging because of the free face mask potential! 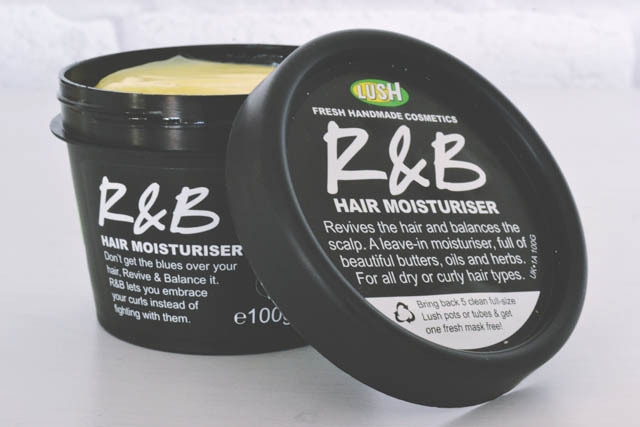 R&B can be applied on either wet or dry hair. I'd recommend starting with dry hair as, in my experience, it's more difficult to keep track of how much you're using on wet hair and can result in a greasy apperance when it dries. Having said that, it certainly does leave your hair moisturised and, when used on wet hair, helps it dry in a much more tamed way. When applying on dry hair, it's much easier to get just the right amount and hit that balance between moisturised, behaving hair and greasy-looking hair. Either way, the earthy floral scent of orange flower and jasmine perfumes the hair and, just like Shine So Bright, keeps it smelling nice for hours. By the way, the scent of R&B complements the Shine So Bright fragrance perfectly. I think these products will keep me going for now, although I'm really keen to try Fluff Ease! Do you have any recommendations for my dry, frizzy hair? I'll never forget the day I discovered R&B, I think it changed my life (or at least my hair!) forever!